Professor Eleanor Stride joins NDORMS as the new Professor of Biomaterials, leading the department’s vision in this area of research. 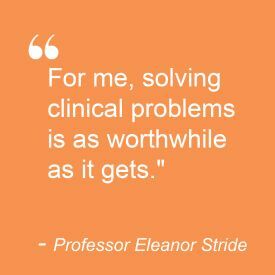 Eleanor is an internationally recognised researcher in medical engineering with pioneering work in biomaterials and their clinical applications, recognised as one of the 50 most influential women in Engineering in 2016. Her research interests focus on applying engineering principles to solving clinical problems, specifically in drug delivery systems in engineering and biomedical ultrasonics. “I am very excited to join NDORMS and foster the genuine integration of engineering and medical research, maximising the benefits of the co-location with clinical researchers. Engineers have a different approach to problem-solving and that can be very useful for multidisplicinary questions. We are trained to analyse systems and solve problems. For me, solving clinical problems is as worthwhile as it gets." At NDORMS, Eleanor is particularly keen to develop the concept of engineering delivery systems that actively modify the tissue environment to facilitate therapy. “I believe there is enormous potential for exploiting the synergies between the work being carried out within the Institute of Biomedical Engineering on drug delivery and minimally invasive therapy, and the pioneering research on musculoskeletal and inflammatory conditions in the Botnar and Kennedy Institutes, at NDORMS”, says Professor Stride. Eleanor and her team will bring together their expertise in the fabrication of agents and devices for stimuli responsive drug delivery with the state of the art models, and analytical and imaging techniques being developed at NDORMS. Engineering systems for modulating tissue hypoxia. Professor Stride holds a B.Eng. and Ph.D. from University College London. Following the completion of her PhD in 2005, she was appointed to a lectureship and a Royal Academy of Engineering and EPSRC Research Fellowship and subsequently a Readership in 2010. She joined the Institute of Biomedical Engineering in Oxford in October 2011, where she’s been leading an international multidisciplinary team since. Her work has led to the development of new patented technologies for the preparation of microbubble suspensions for ultrasound imaging and drug delivery and she has set up a spin-out company in this area. She will hold a joint professorship with the Department of Engineering of the University of Oxford, at their Institute of Biomedical Engineering.